Vietnam tourism has significantly gained in popularity over the last few years. And why not? Haunting landscapes, jewel-studded waters, the romance of a pastoral life and impressive architecture – for those struck with wanderlust, Vietnam is paradise. But if you were to consider Vietnam visits worthy merely for its natural beauty, or cultural heritage, you’d be doing the country a disservice. Because, Vietnam tourism is incomplete without trying the food of Vietnam! Vietnamese cuisine, one the healthiest in the world, is all about freshness, and many chefs shop twice a day for ingredients. The real appeal lies in the balance of flavors and according to Forbes, Ho Chi Minh city, formerly known as Saigon, is one the 10 best places in the world for street food. Each region has a dish they make especially well. Despite heavy historical and geographical influences, the cuisine is unique to Vietnam. It’d be a shame to miss out on local delicacies, which add that little bit extra to your Vietnam experience. China has certainly left its mark in the north – the love for noodle soups and stir fries all comes from the Chinese. If you’re not very fond of spicy food you’re going to love the food in Hanoi! Pepper is about the only spice northerners indulge in. 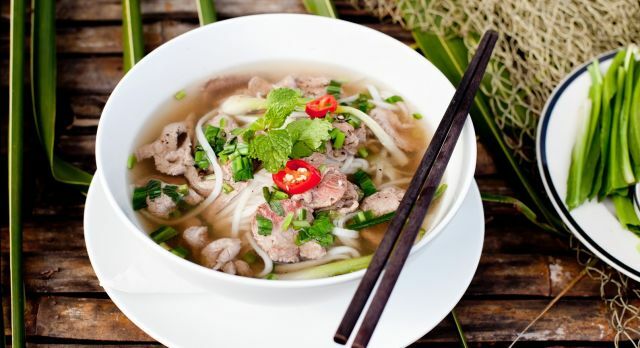 There is no way that you can be in Vietnam and avoid Pho, often called the ‘national dish of Vietnam’. The aroma of freshly cooked Pho (noodle soup) wafts in from almost every busy street in Hanoi. You’ll find hundreds of people seated on plastic chairs in front of street-side restaurants every morning, sipping from their soup bowls. Try Pho – a simple salty broth, with rice noodles, beef (popular in the north) or chicken, and fresh herbs. Sample delicious grilled pork for lunch, served with vermicelli rice and called Bún chả. 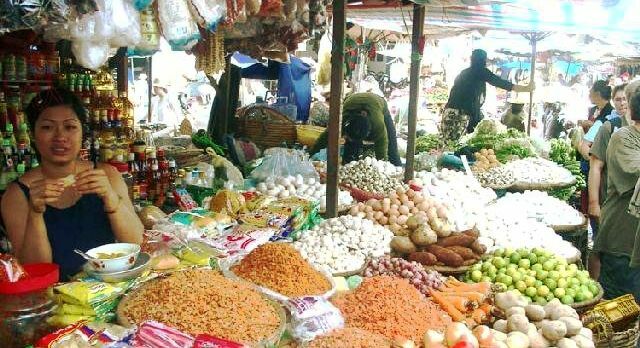 Just follow the heady aroma to the smoky grill of any street-side shop and you’ll find patrons in front of restaurants, hungrily wolfing down mouthfuls of this dish. It’s quite a favorite in Hanoi! A street-side restaurant in Hanoi, Vietnam. Tip: You’ll probably want to avoid dog meat, or even cat, both of which are rather popular in the north. 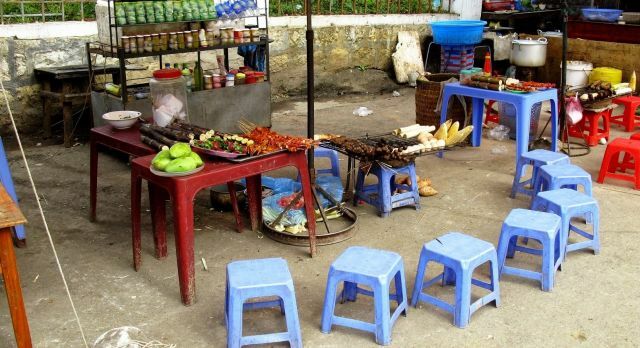 The people of Central Vietnam love spicier cuisine. In Hue, food is cooked elaborately and the dishes are very colorful. The main course is served with many sides, like in an Imperial banquet – a hangover from the Imperial days of yore. Try the Bánh khoai, a stuffed crepe made of rice flour, cooked with turmeric and pan fried to perfection. You can find delicious Banh khoai everywhere in Hue, but we recommend the ubiquitous street carts for some authentic flavors. If the lantern-lit beauty of Hoi An’s streets doesn’t take your breath away, the Cao lầu that’s a specialty here, certainly will! Cao lầu is made only with water drawn from the thousand year old Ba Le well. 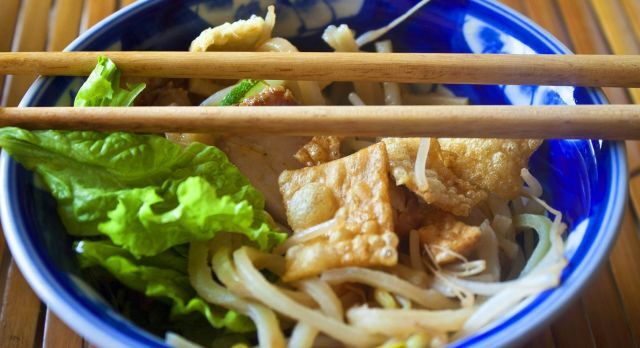 This dish is an incredible mixture of many different cuisines – the thick noodles remind you of Japanese Udon and the wonton crackers are typical of the Chinese; but it’s the herbs and the broth that make this dish unique to Vietnam! Tip: Try your hand at cooking a local delicacy in one of the many cooking schools of Hoi An. Click here to read more and book yourself a cooking class. Ho Chi Minh City in the south boasts of delicious cuisine, distinctly different from all other regions. French colonization has left its mark on Ho Chi Minh City and you will find lovely boulevards and coffee shops around every corner. 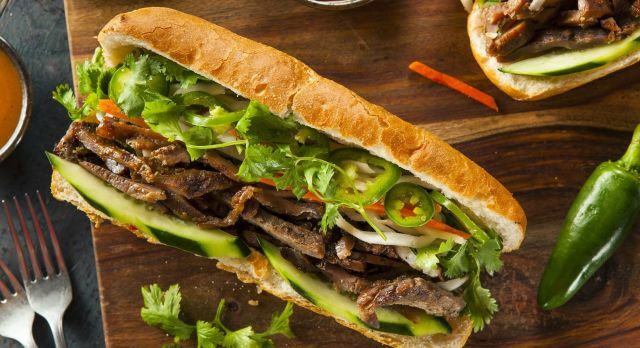 The Bánh mì – much like a stuffed baguette, is an obvious leftover from the colonial era. The Pork Bánh mì Sandwich is very popular in Saigon. The Bánh xèo is a great way to keep hunger at bay while you drift through the floating markets of Saigon. These are pancakes fried with a heap of things, and wrapped in lettuce and herbs. In the warm, tropical south, people prefer their food sweeter. 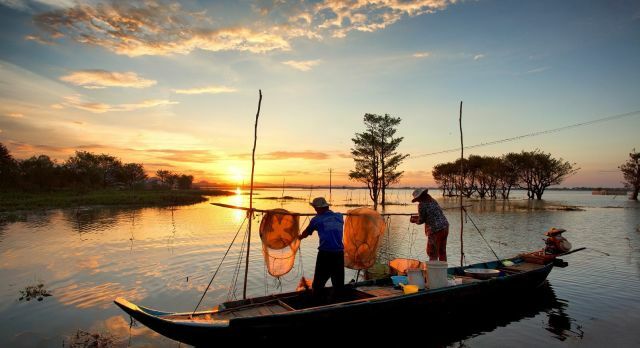 The Mekong Delta is the world’s second largest producer of rice, often called the ‘rice bowl of Vietnam’, and it’s no surprise that the southerners prefer rice to noodles. Seafood is very popular here thanks to the extensive coastline, as are tropical fruits. Fishermen at work in the Mekong Delta of Vietnam. In the Mekong Delta, the Canh chua, which literally means ‘sour soup’, is very popular. Made from fresh fish from the delta in a tamarind flavored broth, it’s like an explosion of flavors in your mouth, in a good way of course! When in Vietnam fish sauce is unavoidable, so why not try the best there is? Try Phú Quốc, made from anchovies found near the Cambodian border and you won’t be disappointed! 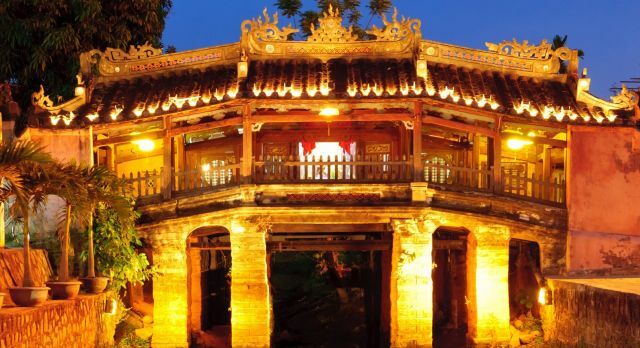 Do you want to experience the best of Vietnam? See our sample trip itineraries here.